Ultra-concentrated refills in premium fragrances work faster and stay in the air longer. Half the size of ordinary refills, but twice the odor-fighting power. 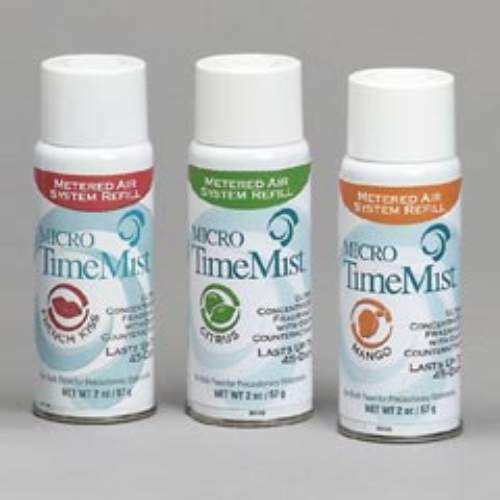 For use in Micro TimeMist® Ultra Metered Dispenser TMS 1041TM1, TimeMist® Classic Series and Tim eMist® Plus Series dispensers (sold separately). Can also be used as a personal air freshener—the 2-oz. refill is perfectly sized for pockets, purses, desktops. 15- to 45-day refill (depending on spray interval setting). 12 refills per case.